The day finally arrived. It is the Fourteenth of October. All of our planning, making, and dreaming would be realized in just a few short hours. On this day, I promised myself to breathe in the air, relax, and enjoy the moments. At 2:30 p.m. Brielle will walk down the aisle. All wedding photography by Allison Kuhn. 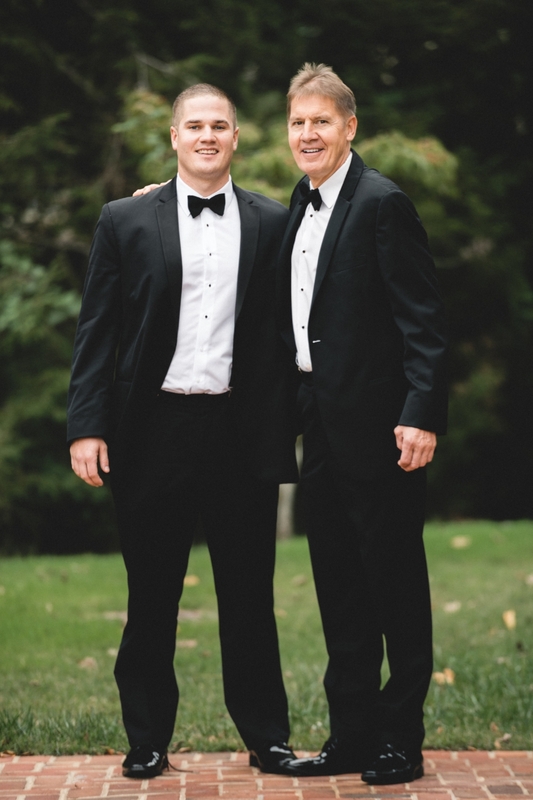 Jeff and I stayed many nights at the Westin over an eight year span while Brielle and Aubrey received their undergraduate degrees from the University of Richmond, followed by Brielle's Juris Doctor from the T.C. Williams School of Law. This hotel felt like our home away from home. It seemed natural that Brielle and Alex chose the Westin for their guests to stay for their wedding weekend. The Westin has welcomed us for all of our UR Parent Weekends, visits with Brielle and Aubrey, Spider field hockey games, and three graduations. This time they welcomed us for a wedding! The bridal suite was incredible! Large enough for Brielle's bridal party of eight and full beauty staff. Morning brunch was gifted by the bride with some pre-wedding mimosas. Beauty for the bridal party and moms was provided by Avenue 42 Style Studio in Richmond. I was amazed at how calm Brielle was. 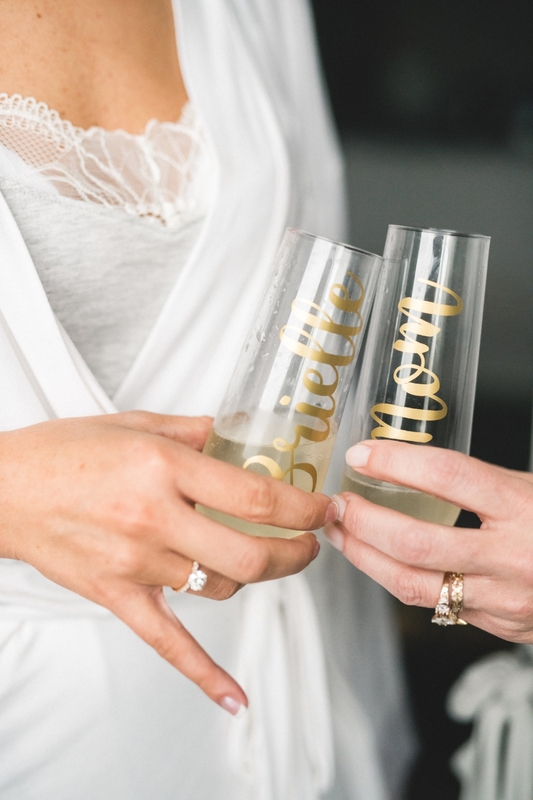 I loved watching her as she enjoyed time with her bridesmaids, snuggled with her adorable flower girl, and made me feel as though I was more than her mom. Brielle and I became even closer through the process of planning her wedding. I have always been someone who prefers a homemade gift over anything else that can be wrapped. At the perfect time, Brielle called me to the corner of the room and handed me a bag with a beautiful note inside and this two framed photo. It is a picture of me on my wedding day thirty-five years ago alongside a wedding portrait of her taken at Tuckahoe Plantation just four weeks before. Alex chose to get ready at their new home in Richmond. 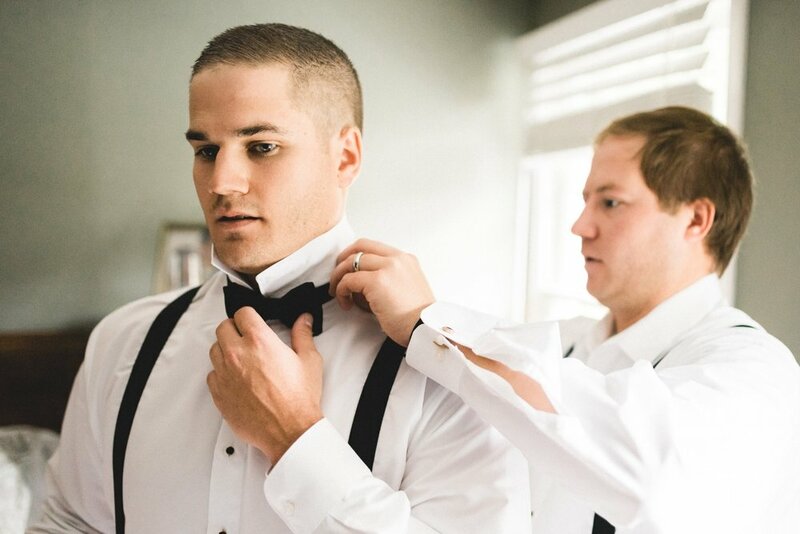 Andrew, his brother and best man, knew the routine. Andrew married Candace just five months before. There was a uniqueness to the friendship and camaraderie at the Maffet home. Friends stopped in to give their best wishes while the groomsmen readied for the ceremony. I felt the morning time ticked by at the perfect rate while dressing for the wedding. We had time to chat, smile, laugh, and hug. There was a special kind of togetherness among all in the bridal suite. Suddenly, we realized it had to come to an end. The Richmond Trolley was waiting... and so was Alex! There are no words to describe Abbey. She looked beautiful in her silk "Melody" dress by Isabel Garreton. 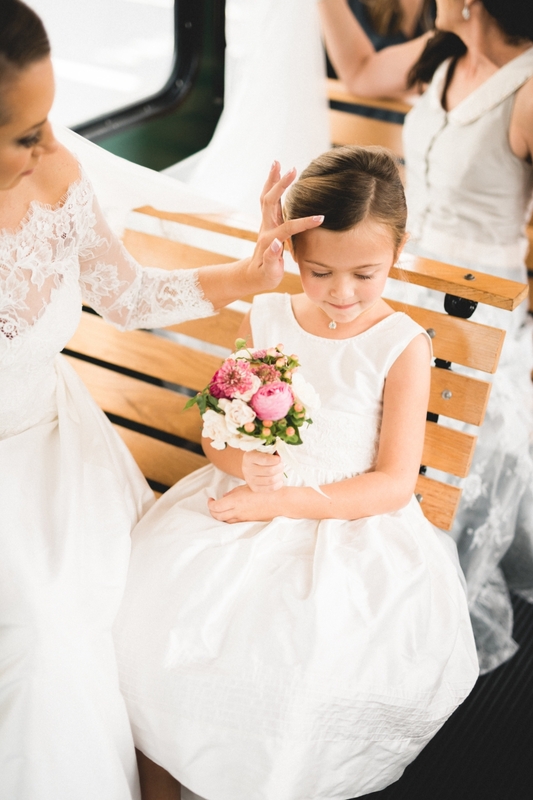 If there was such a thing as a perfect flower girl, Brielle found that in adorable Abbey. She was loving, helpful...and youthfully patient. Time to dress the bride! 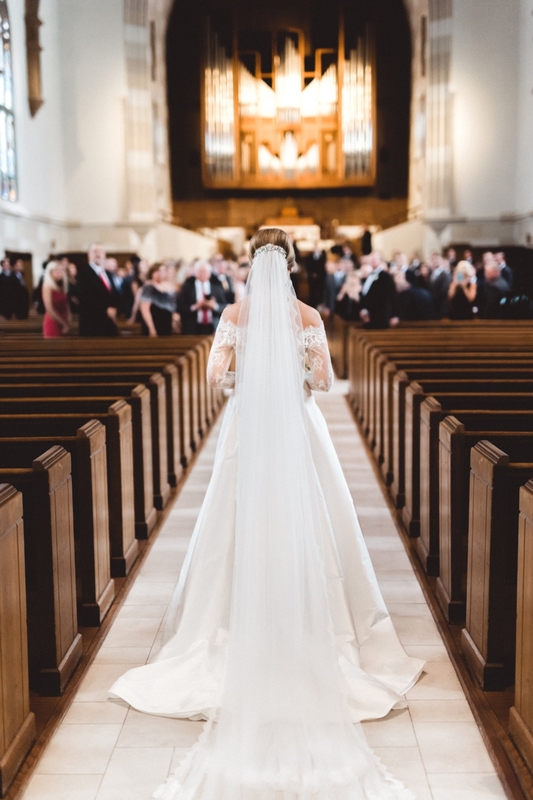 Brielle stepped gracefully into her silk, alençon and chantilly lace Valentine wedding gown by Lea-Ann Belter. The memories of our wonderful weekends driving to Something Bleu Bridal in Saratoga Springs culminated in this final moment. Aubrey knew the perfect buttoning technique for Lea-Ann's classic lace jacket design. I have done this thousands of times with my clients at Headpiece.com. This time it was for real. This beautiful design needed to be perfectly placed and secure for the long walk down the chapel aisle. In twenty-six minutes Alex will see his beautiful fiancée as she enters the doors to the chapel. There are two moments I will remember forever. It is amazing that Allison Kuhn captured both. We were on the Richmond Trolley on our way to the chapel. Everyone aboard was happy and calm. You could hear slight chatter amongst bridesmaids with the sound of the old fashioned trolley motor in the background. Brielle turned to me and only I could hear her say..."Mom, I am so happy!...and I love everyone here!" My heart raced with happiness. She had no idea how overwhelming my love was for her at that moment and the delight that Alex would soon be my son-in-law. Brielle always knew Abbey would be her flower girl, since the day she was born. It was so important to Brielle that Abbey was near. Abbey's part in this day was important to her heart. The trolley had a bit of maneuvering problems on campus. Brielle said, "Stop right here! We are getting out!" She had no cares about the uphill walk, or the steps, in her heels. She was ready to get married! We all found our way to the chapel. We were running ten minutes behind which is not really Brielle's style. Those ten minutes allowed for moments which wouldn't have happened had we been on time. Brielle wanted to do a first look with her dad in the beautiful courtyard of the chapel. She had planned for this moment since the day she found her wedding dress. Jeff was the one who twirled her in his arms in the livingroom at five years old, the one who came in second place with her in the father/daughter waltz competition at Oak Knoll School, and the one who danced with her bare aching feet on top of his polished shoes at University of Richmond Ring Dance. She wanted him to see her first and to see his expression as she prepared to meet Alex at the end of the aisle. I carried Brielle's veil and saw Jeff waiting for her down the brick walkway. I gave her the veil to carry the rest of the way and she said, "Mom, I want you there too." I had always pictured this moment to be between the two of them. My heart was unprepared for this moment, but it was one of the best in my life. Brielle's beautiful bridesmaids were ready to process. All chose a gown style from the Jenny Yoo Collection of a soft luxe chiffon in the color "storm". Brielle and Aubrey have been around bridal veils and headpieces since they were little. However, this veil was different! 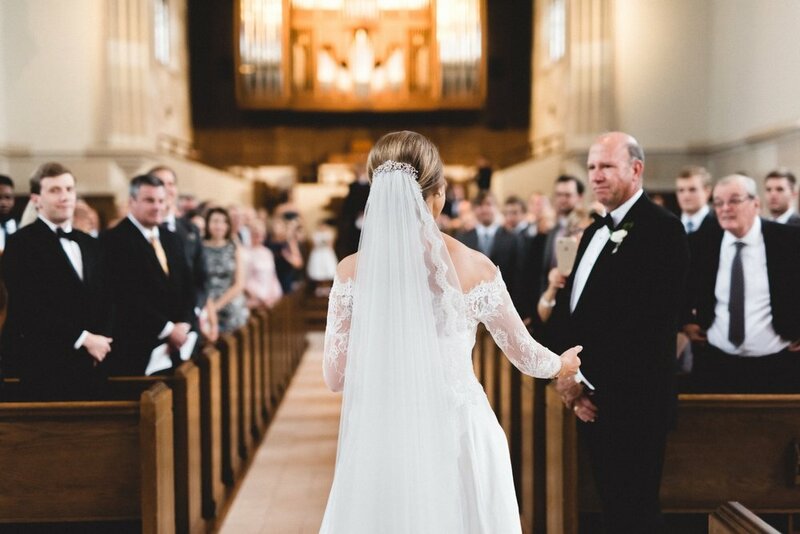 It was designed for Brielle "only"--a long two tier cathedral veil made of soft European net and hand edged with the finest French laces. Abbey was happy to do her part. She said to Brielle as they were ready to enter the chapel, "This is so much fabric!" The doors opened and Brielle entered soley. She met her dad and took his arm to take her the rest of the way. My mom watched and listened as her first grandchild married. My mom has never looked so beautiful. I love her so much. There were tears of joy and smiles of the heart as Aubrey sang the words. Aubrey sang I Get To Love You...by Ruelle, accompanied by the harp and violin of the James River Duo. I stitched the wedding rings a bit too tight to the silk ring pillow. Introducing Mr. and Mrs. Alex Maffett. You may kiss your bride! The wedding ceremony was beautiful, personal, and heartfelt. The rest of the day and night would prove to be one of the most fun and unique wedding celebrations ever. Join us next month on the Fourteenth as we party with the Maffs! It will make you want to dance! This "teaser" by Something Blue Films will get you to come back. There will be more where this came from. See you at the reception!